This magnificent authentic Cartier tennis bracelet is the perfect piece for everyday wear. 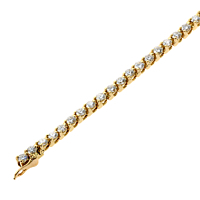 Simple in design yet blazingly beautiful, the Cartier diamond gold tennis bracelet ensconces the finest Cartier round brilliant cut diamonds in individual pockets of warm 18k gold. This Cartier tennis bracelet is both sporty and elegant, and she who wears it will most definitely be a superstar!